The following article is based on a slide presentation on aircraft corrosion. 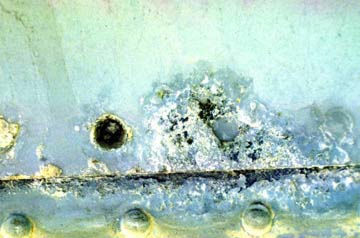 The accompanying photos were taken in Hawaii and show examples of corrosion on interior and exterior aircraft surfaces. Hopefully this article will make pilots owning or renting aircraft more aware of this problem and give them a better idea of what to look for during their preflight inspection. Corrosion is a natural phenomenon which, in its most common form, uses an electrolyte to convert the refined metal into a stable metallic compound such as an oxide, hydroxide, or sulfate. The rate at which metals corrode depends greatly on the environment they are exposed to, and the amount of preventive maintenance they receive. Metals that are exposed to marine atmospheres, moisture, tropical temperatures, and industrial chemical atmospheres have the greatest rate of corrosion. Obviously, corrosion is a serious problem for aircraft in most parts of the world. The amount and rate of corrosion is a function of the type and frequency of preventive maintenance they receive. Stopping the corrosion progress and preventing any new corrosion cells from forming is a constant battle. The following information will help airmen become aware of what to look for when performing an aircraft inspection. 1. Oxidation. The uniform oxidation of metal surfaces is the most common form of corrosion. Also called 'dry' corrosion, it is formed when a metal is exposed to a gas containing oxygen. On a polished surface, this type of corrosion is first seen as a general dulling of the surface. This surface corrosion actually provides a semi-protective coating of the metal below. 2. Uniform Surface Corrosion. Uniform surface corrosion results from the direct chemical attack on a metal surface and involves only the metal surface. The most common element in this type of corrosion is atmospheric pollution and is generally observed on all surfaces of the aircraft. 3. Pitting Corrosion. A common form of corrosion on aluminum and magnesium alloys is pitting corrosion. It is first noticeable as a white or gray powdery deposit, similar to dust, which blotches the surface. When the deposit is cleaned away, tiny pits or holes can be seen in the surface. The corrosion byproducts of aluminum and magnesium are loose, porous, and readily absorb moisture. Over a period of time the metal surface will become rough, pitted and eventually have to be replaced unless it receives a protective coating. The deep pitting will destroy the integrity of the part. To be effective, this coating must remove any moisture present in the corrosion byproduct as well as sealing the surface against further contact with the atmosphere. 4. Galvanic Corrosion. Galvanic corrosion occurs when two dissimilar metals make electrical contact in the presence of an electrolyte. The most active metals (those which tend to lose their electrons easily), such as magnesium and aluminum, corrode easily. Metal Ion Concentration Cells - The electrolyte usually consists of water and ions of the metal in contact with the water. A high concentration of metal ions will normally exist under faying (tightly joined) surfaces where the solution is stagnant, and a low concentration of the metal ions will exist adjacent to the crevice created by the faying surfaces. The area of the metal in contact with the low concentration of metal ions will be anodic and corrode. The area in contact with the high concentration of metal ions will be cathodic and not show signs of corrosion. Oxygen Concentration Cells - The solution in contact with the metal surface will normally contain dissolved oxygen. An oxygen cell can develop at any point where the oxygen in the air is not allowed to diffuse into the solution, thereby creating a difference in oxygen concentration between two points. Corrosion will occur in the area of low oxygen concentration. Alloys, such as stainless steel, are particularly susceptible to this type of crevice corrosion. Active/Passive Cells - Metals, such as stainless steel which depend on a tightly adhering, passive film for corrosion protection (usually an oxide), are prone to rapid corrosion attack by active/passive cells. The corrosive action usually starts as an oxygen concentration cell. The passive film will be broken by the presence of dirt or other foreign substance deposited on the surface. Once the passive film is broken, the active metal beneath the dirt will be exposed to attack. An electrical potential will develop between the large area of the cathode, which is the passive film, and the small area of active metal, which is the anode. The result is rapid pitting of the active metal. 6. Intergranular Corrosion. Most alloys are made up entirely of small crystalline regions, called grains. Intergranular corrosion is an attack along the boundaries of these grains. The grain boundaries differ, from a chemical point of view, from the metal within the grain center. The grain boundary and the grain center can react with each other as anode and cathode when they are in contact with an electrolyte. 7. Exfoliation Corrosion. Exfoliation is an advanced form of intergranular corrosion where the surface grains of metal are lifted up by the force of expanding corrosion byproducts beneath. This lifting or swelling is visible evidence of exfoliation corrosion. 8. Filiform Corrosion. Filiform corrosion is a special form of oxygen concentration cell corrosion that occurs on metal surfaces which have been coated with polyurethanes. The problem is that the paint is so thick with pigments and resins that the surface of the metal cannot breathe. This means that if there was any moisture there to begin with, it will stay there and grow as filiform corrosion. Fililform corrosion may also start at breaks in the coating system. 9. Stress Corrosion. The rate at which corrosion proceeds may be accelerated by a number of mechanical factors. Stress on aircraft parts may be residual within the part as a result of externally applied cyclic loading or as a result of the production process. Corrosion fatigue is caused by the combined effects of cyclic stress and corrosion. No metal is immune to some reduction in its resistance to cyclic stressing if the metal is in a corrosive environment. Fracture of a metal part due to fatigue corrosion generally occurs at a stress level far below the fatigue limit. The amount of external corrosion is a poor indicator of the strength of the part. For this reason, corrosion protection of all parts subject to alternating stresses is particularly important, even in environments which are only mildly corrosive. Fretting is another mechanical factor which contributes to the speed of destruction. Damage can occur at the interface of two highly loaded surfaces which are not designed to move against each other. The most common type of fretting corrosion is caused by vibration. The protective film on the metal surfaces is removed by the rubbing action and exposes fresh, active metal to the corrosive action of the atmosphere. 10. Micro-Organism Corrosion. Microbial attacks on metallic surfaces include the actions of bacteria, fungi, and molds. Micro-organisms occur nearly everywhere. Those organisms causing the greatest corrosion problems are bacteria and fungi. Aerobic bacteria accelerate corrosion by oxidizing sulfur to produce sulfuric acid. The metabolism of an aerobic bacteria requires them to obtain part of their sustenance by oxidizing inorganic compounds such as iron, sulfur, hydrogen, and carbon monoxide. The resultant chemical reactions cause corrosion. Corrosion is a constant threat to the integrity of the aircraft. Corrosion is expensive and compromises safety. Corrosion prevention is cost effective. As we have seen, when moisture is present for prolonged periods of time, corrosion cells are formed. These cells act as miniature batteries, feeding the transfer of electrons as long as the oxygen-providing moisture is present. If you can isolate the moisture from the metal surface, the process stops. Preventive corrosion control should be a serious part of your maintenance program. This article is based on a slide presentation by the Pacific Corrosion Control Corporation.